This weekend, the CIS#2/AUS#1 V-Reds (16-5-2) travel to Nova Scotia to take on the CIS#9/AUS#3 Acadia Axemen (15-7-2) on Friday night and the AUS#7 Dalhousie Tigers (6-14-3) on Saturday night. Both games are slated for 7pm. A breakdown of the head to head stats of these teams can be found below. The V-Reds are coming off a pair of wins that saw them regain first place in the AUS with a 2 point lead over SMU (15-7-2), Acadia (15-7-2), and Moncton (16-7-0). Travis Fullerton returned to the crease this past weekend, and the V-Reds seemed more energized for it. The V-Reds currently lead the AUS in several categories including Goals – 102, Goals/game – 4.43, Goals allowed – 2.78/game, Assists – 169 ~ 7.35/game, Points 271 ~ 11.78/game, Shots – 818 ~ 35.57/game, and Short Handed Goals – 11. The V-Reds are led in scoring by Kyle Bailey (14G 14A), Chris Culligan (7G 21A) and Luke Gallant (4G 17A). The Axemen are currently on a two game losing streak, and will look to turn things around on home ice this weekend in an attempt to regain first place in the AUS. This is the third game of the season between these two teams, the V-Reds have a 2-0-1 record this season against the Axemen, and a 31-10-2 regular season record in the past decade. The Axemen are lead in scoring by AUS points leader Andrew Clark (14G 22A), Chris Owens ( 9G 19A), and Liam Heelis (8G 13 A). The Tigers are fighting for the last playoff spot with The StFX X-Men (6-13-4) who they currently trail by one point. The Tigers are on a three game losing streak, and know that they need to pick up points this weekend if they want to have a run in the playoffs. This is the third meeting of the regular season between these two teams, the V-Reds have won all three of those games, but the last one was only decided in overtime. In the last decade, the V-Reds have a 32-8-1-2 regular season record against the Tigers. The Tigers are lead in scoring by Benjamin Breault (8G 17A), P.-Alexandre Vandall (5G 14A), and David MacDonald (7G 11A). 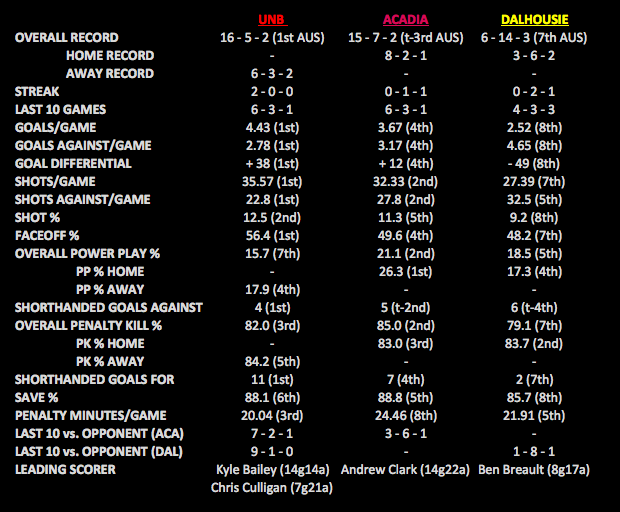 The Acadia game can be seen here, while the DAL game can be viewed here. Of course, you can always follow UNBHockey on Twitter for the latest updates.